Choosing a major and choosing a career may or may not be the same thing. Certainly there are correlations…if you want to be a nurse, then you need to major in nursing. If you want to be in public relations, you could major in numerous majors such as communication studies, journalism and mass communication, English, business or others. 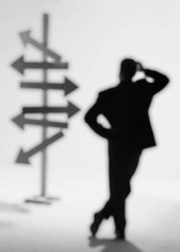 Choosing a major is an integral part, but not the only part, of career development/career choice. At NMSU all students must fulfill approximately 38 hours of University General Education (UGE) credits. If you are undeclared, work on your UGE credits while exploring various classes that catch you attention. Come into the Career Center to discuss your overall career plan and how various majors fit into your plan. If you know what career you want but do not know what to major in, come into the Career Exploration Center and look at the books connecting college majors to career titles. Also, check out our website, Information on Majors.